"Thank you for the positive contributions you make to Canadian society each and every day." The inaugural Muslim Awards for Excellence (MAX) Gala, held last month at The Ritz-Carlton in Toronto, was truly a night to remember. Attended by luminaries in Canadian politics, medicine, law, business, development, academia and the arts, the Gala honoured the achievements and contributions of Canadian Muslims. It was our great privilege to have Prime Minister Justin Trudeau open the MAX Gala with video greetings to the audience. He said, "I want to congratulate everyone being honoured tonight. Thank you for the positive contributions you make to Canadian society each and every day ... Tonight is a testament to the fact that diversity is our greatest strength." Attending in person were the federal Minister of International Trade, Chrystia Freeland; the Premier of Ontario, Kathleen Wynne; the Ontario Minister of Finance, Charles Sousa; and the Mayor of Toronto, John Tory. In our very first year, we had the esteemed support of federal, provincial and municipal levels of government; major corporate sponsors; and an audience of 500 that sold out weeks in advance. We are also grateful to our keynote speakers Zaib Shaikh, the City of Toronto's Film Commissioner and Director of Entertainment Industries, and Dr. Mohamed Lachemi, President and Vice-Chancellor of Ryerson University. The press too shone a spotlight on MAX, as CBC News, Rogers TV, The Toronto Star and other news outlets profiled us on television, in print and online. This same spirit of celebration and support pervaded the evening of the MAX Gala. After the high school student scholarship winners were announced, a generous anonymous donor granted scholarships to the remaining finalists in the category. Later in the evening, when Dennis Edney, lawyer of Omar Khadr, won the MAX Friend of the Community award, the audience gave him a moving standing ovation. We are looking so forward to celebrating the excellence of the Canadian Muslim community at the MAX Gala 2017. 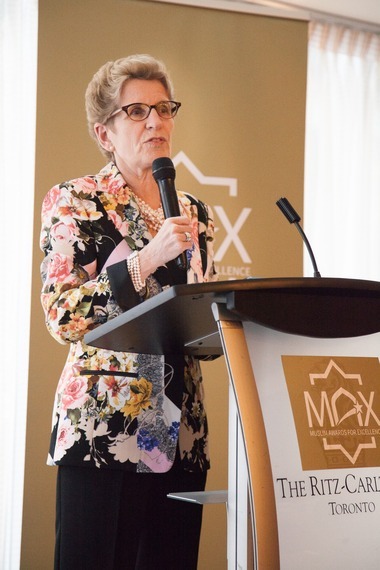 As Premier Kathleen Wynne said in her opening remarks at the pre-Gala VIP reception, "We all need to push back against hatred and intolerance. Our responsibility is to model a story that shows our capability to love." MAX Platinum Awards of Excellence - Recognizes three Muslims who have demonstrated significant achievement, leadership, and commitment to serving their community. MAX Friend of the Community - Recognizes a non-Muslim individual who has demonstrated outstanding service to the Canadian Muslim community. MAX Entrepreneur of the Year - Recognizes an inspirational Muslim entrepreneur who has had a significant and positive impact on their community through their business leadership. MAX Woman of the Year - Recognizes a Muslim woman who has demonstrated significant achievement, leadership, and commitment to serving her community. MAX Emerging Venture of the Year - Recognizes a Muslim-run venture looking to maximize on their potential. MAX Charity of the Year - Recognizes a Muslim-run charity that has demonstrated excellence in program design and service delivery.